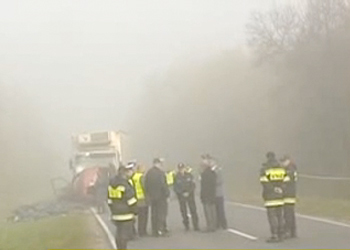 One of the worst road accidents in recent times occurred this morning in the Mazowiecki Voivodship in the vicinity of Nowe Miasto nad Pilicą, about 80 kilometres from Warsaw on regional road 707. Tadeusz Kaczmarek, spokesman for the Mazowiecki police confirmed that there were 16 dead at the scene. Two severely injured individuals were transported to the hospital in Radom where they died shortly thereafter. All the fatalities were passengers aboard the minibus, which only had 4 proper seats. Most of those in the vehicle were standing or sitting on crates. The passengers are believed to be seasonal workers; all seem to have been middle-aged males. “The vehicle was meant to carry freight. The passengers did not stand a chance, they were packed in like packages,” Kaczmarek added. A three-day period of mourning has been announced in the area. It is believed that the dense fog and high speeds contributed to the accident. The lorry driver has survived and is being treated for less severe injuries in hospital. It seems that the minibus swerved into the oncoming traffic lane where it collided head on with a large Volvo lorry.